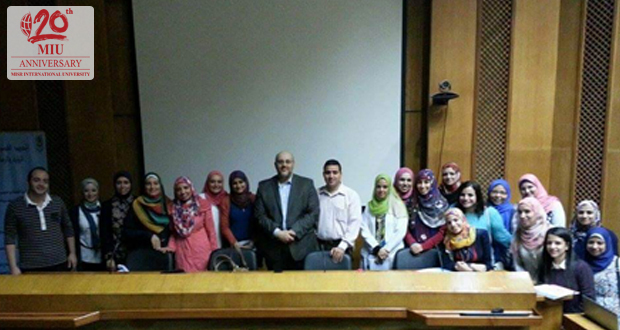 Dr Taher Hegab, Assistant Professor of Clinical Sciences at California Health Sciences University, visited the MIU Faculty of Pharmacy and conducted two workshops from November 13 to 27, 2015. Dr Hegab also presented a session in the 9th Continuing Education workshop of the Faculty of Pharmacy that was held on the 26th of November, titled “Pharmaceutical Care in Critically Ill Patients.” This workshop was conducted as part of ACPE accredited series of the Continuing Professional Pharmacy Development Program at MIU. Attendees included 100 hospital and clinical pharmacists from diverse health institutions in Egypt as well as academic colleagues from governmental faculties of Pharmacy. Moreover, Dr. Hegab contributed to teaching senior pharmacy students topics on Acute Kidney Injury and Sepsis.